Pioneer Ent./Phuuz Ent. (current releases) TMS Ent. This info and image came from Who Wants to Know?, and was edited by yours truly (contact me). Call him what you will: "The Wolf", "The world's most wanted". Just watch your valuables when you're in the presence of Arsene Lupin III. 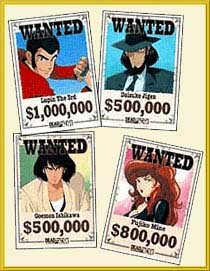 With his two partners by his side, a pretty rival in his heart, and one persistent Interpol agent on his heels, Lupin travels the world in search of fame, fortune, and fun. The storyline was inspired by Arsene Lupin: Gentleman Thief , a series of stories written by Maurice LeBlanc at the turn of the 20th century, but the art style was inspired by the shenanigans of America's own MAD Magazine . Today, Lupin III and company are some of the most recognized figures in anime and the series probably the most popular anime series in the history of the genre. It remains a favorite among fans of action comedy. Lupin III, as seen in Japan, was a pioneer in anime: the first series to actually be set in the real world (instead of imaginary locations, Lupin's adventures take place in Australia, Hong Kong, Europe, etc. ), with recognizable landmarks and brand names, and the first to be directed at an adult audience (in this case, a college-age audience full of the liberalism of the late 60's-early 70's). It actually comprises 3 different series. The first series was the shortest (called off at 23 episodes) and shows some signs of crudeness, violence, and antagonism between the characters. The second series, The New Lupin III , is the longest (155 episodes) and most recognizable: released mostly by public demand for more Lupin after the first series gained momentum in reruns. It focuses more on simpler action and over-the-top hijinks, giving it a lighthearted air similar to what you see in the original Dragon Ball , and it comes off being very entertaining. Little is known stateside about the third series, Lupin III Part III , generally because it isn't held in high regard. Originally, Streamline Pictures released select episodes under the label Tales of the Wolf , and then produced a dub of one of the most popular Lupin III movies, The Castle of Cagliostro . Now, Pioneer has acquired the rights to publish The New Lupin III series.